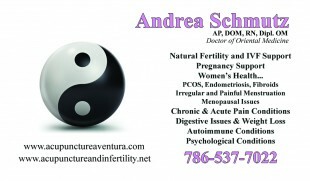 Dr. Andrea is a licensed acupuncturist with vast experience in both western and eastern (holistic) medicine. Please take a look around our website to learn more about what we do and if you have any questions please contact us at 786-537-7022 and we’d be glad to help you. Her clinic is located on Biscayne Blvd in Aventura Florida but within minutes of North Miami Beach, Hallandale Beach, Sunny Isles and Golden Beach.